The Dubai 7s hasn’t been the happiest of hunting grounds for Dubai Hurricanes in recent years. 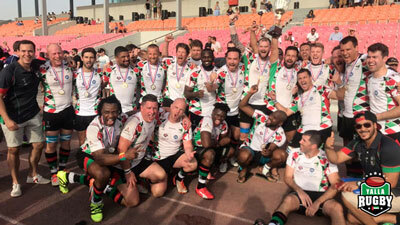 Despite being regular co-tenants at the Sevens Stadium they’ve found themselves watching from the stands as Dubai Exiles, Abu Dhabi Harlequins and Jebel Ali Dragons have shared the trophy amongst themselves since their maiden triumph in 2007. Hurricanes did not enter this year’s tournament as favourites either, despite some improved performances in the West Asia Premiership, they weren’t expected to match the firepower of the Gulf’s top teams. But in this final against a Harlequins side which had averaged 37.5 points a game in reaching the final, a calm, assured display built on a swarming defence saw them run out as clear and deserved winners. The match looked over as a contest early into the second period when Joseph Riley stretched clear on the left wing to put his side 17-0 up straight after half time. Harlequins players were left protesting what looked to be an infringement in the build up which put Riley into the clear, but in reality it was only a fair reflection of the dominance of the Dubai outfit with the game having been played out almost exclusively in the Quins 22 until that point. Both sides came into the final unbeaten and having survived nailbiting semi finals with Jebel Ali Dragons and Bahrain respectively. But the capital city outfit just could not get their game going early on, finding themselves camped under their own posts for the opening three minutes. The scoring was eventually opened by Lewis Anderson with Quins a man down after persistent infrigements in the danger area. Discipline proved costly again with a penalty conceded five yards from their own line allowing Boris Finck the opportunity to wriggle over after a quick tap to double the advantage. Uncharacteristic mistakes continued to hamper Quins as frustration set in, lineouts misfired and balls were spilled in attack. This was only compounded by an interception score, run in by the impressive Sakiusa Naisau and converted from wideout by Finck, much to the delight of an increasingy jubilant Canes support. Some powerful direct running from Emosi Ratuvecanaua and Andrew Semple eventually reduced the arrears late on to a more respectable 24-14 but this did nothing to dampen the celebrations of the men in yellow. The latest from across all three divisions in the UAE as the season begins to take shape. 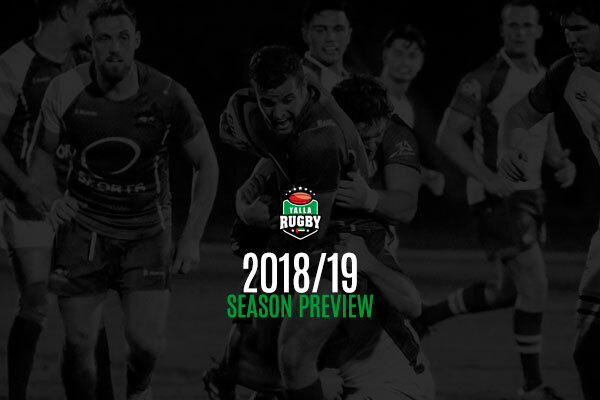 They may not have won this weekend and sit just fourth in the West Asia Premiership table but the last two weeks have shown signs of significant improvement for the Dubai Hurricanes. 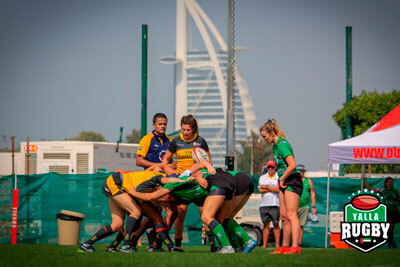 Having failed to register a win against any of the top four throughout last season’s campaign, they have got that monkey off their back at the second attempt this time round, easing to a 27-11 win over Jebel Ali Dragons in Week 3. 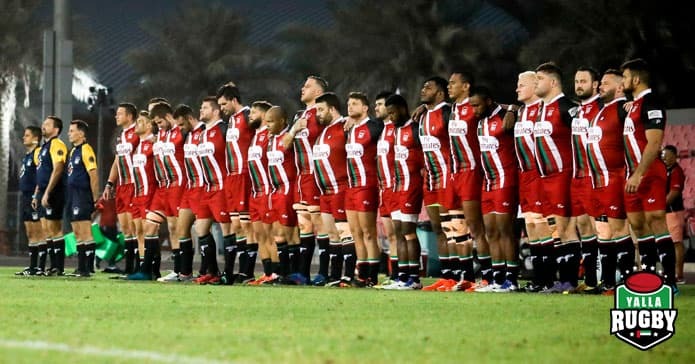 Followed up by a not at all un-respectable display away to Abu Dhabi Harlequins this weekend, Canes have served notice to the big guns that they intend to have a much greater say in proceedings this year. It is nip and tuck at the top of the West Asia Premiership table with no side left unbeaten after four rounds and all signs suggest we have a very open title race to look forward to. Dubai Exiles hold top spot on points difference, having strung three wins together after their opening night loss to the Dragons. Bahrain claimed arguably this weekend’s standout result in coming away from Jebel Ali with a 13-9 scalp. The Dragons, having lost two in a row, will be glad to face bottom side DSC Eagles next week and will want to be sure not to slip up to avoid falling adrift from the pace setters. The next round of games will give us a clearer picture of the Conference standings as each side completes its first round of group fixtures. The fixture between Dubai Tigers and Al Ain Amblers looks particularly enticing, with both sides highest placed in their group and having put up big scores in recent wins over Arabian Knights. Tigers did not have it all their own way however in a see-saw 46-43 win over traditional local rivals Dubai Sharks two weeks ago. The Sharks are another side looking much improved this season having also been competitive in defeat this weekend away to Abu Dhabi Saracens. In the other group, Dragons 2s can complete the opening round undefeated if, as the formbook suggests, they can overcome Eagles 2s next week. Hurricanes 2s currently sit top of that group, having played a game more, coming away with an impressive 35-29 from Zayed Sport City against Harlequins 2s. Just one round of games since our last update. Holders Harlequins 3s and RAK Rugby recorded hard fought wins over Amblers 2s and Tigers 2s respectively but Dragons 3s currently sit top of the pile after putting up something of a cricket score against a struggling Sharks 2s. Newcomers Barrelhouse were left with a rest this week as Shaheen forfeited their game due to Arab Rugby competition in Cairo for the National 7s squad. 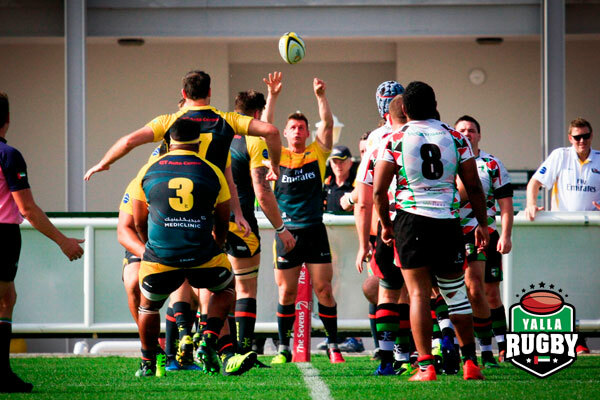 We catch up with the action from last weeks UAE Rugby fixtures in the Premiership, Conference and Community leagues. 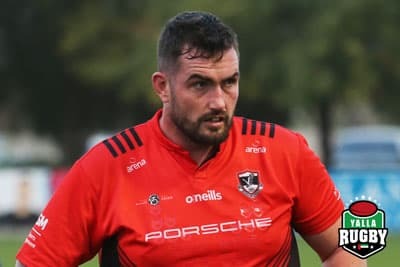 We’ve gone for the Hurricanes’ Conference side this week for throwing up what on form was the biggest surprise result of the round in their comprehensive 53-25 triumph over Exiles 2s in their derby clash at the Sevens Stadium. The sides had enjoyed contrasting fortunes prior to Christmas with Exiles comfortably qualifying for the top half while Hurricanes crept in by the back door in 5th place. A loss for Canes here would have more or less spelled the end of their season but the men in yellow rose to the challenge with a bonus point win. They will need more of the same in their remaining fixtures if they are to make it to the knockouts but this result will see the likes of Harlequins 2s and Sharjah looking over their shoulders somewhat. 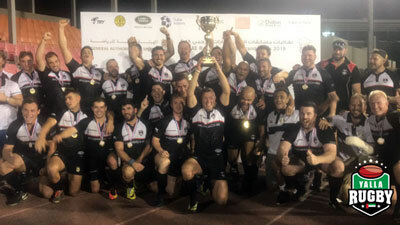 Both Abu Dhabi Harlequins and Jebel Ali Dragons narrowed the gap on top placed Dubai Exiles courtesy of comfortable victories this weekend. 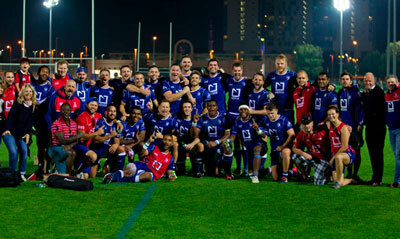 Both title chasers put over 50 points on the board against Dubai Hurricanes and DSC Eagles respectively. Exiles themselves were in West Asia action but returned from Bahrain empty handed having been edged out 19-11. A result which puts beyond doubt that Harlequins, Exiles, Dragons and Bahrain will finish in the West Asia top four. The sides are now left to jostle for position and home advantage in the semi-finals. Two matches took place in both sections of the division and the picture is decidedly clearer at the bottom than at the top. Thumping wins for Al Ain Amblers and Jebel Ali Dragons 2s serve as warm ups for when the sides meet each other in the Bottom 4 half final and leave Dubai Sharks and Arabian Knights looking to their upcoming clash as a decider in terms of who will avoid last place. In the Top 6, the league picture recently had been muddied by some confusion over whether results from the first half of the season carry over or not. 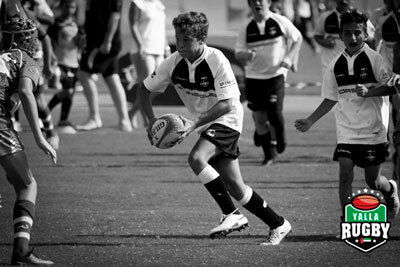 We can confirm that this season, they do indeed carry over – after confirmation from the UAERf. With this being the case, Exiles 2s and Dubai Tigers are now assured of a qualifying birth. This is despite Exiles surprise reverse against Hurricanes 2s which keeps the Canes alive in the competition. The Tigers are the division’s form side since the winter break having won three straight matches after seeing off Sharjah Wanderers 26-10. Just one fixture took place which saw Beaver Nomads come away from Al Ain with an impressive 52-26 win over the Amblers 2s. An important result for the Nomads which puts them up to second in the standings but with a game in hand on leaders Abu Dhabi Harlequins 3s.